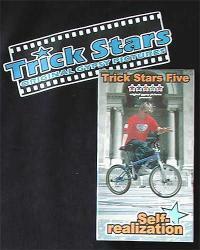 TS5 is the latest issue of the Trick Stars series, edited and produced by Marton Szilagyi. Aka OG, Marton was the pioneer of flatland (come to that fs bmx) in Hungary, he has plenty of experience in all parts of the flat-world, and of course is the boss of the OG-crew, quote: â€œOur intention is to show the stress-free side of flatland with riders filmed without the pressure of contests. Huge props to the riders.â€? Self Realization came out last year, but the riding is still well up to date. This flatland-only video has crisp editing, good music and of course outstanding riding. Sections are smooth, thanks to the good choice of music to go with the riders. 40 minutes of footage comes from a variety of locations: Heros Square (Budapest), Red Bull Circle of Balance 02, Braun Flatground, Worlds. 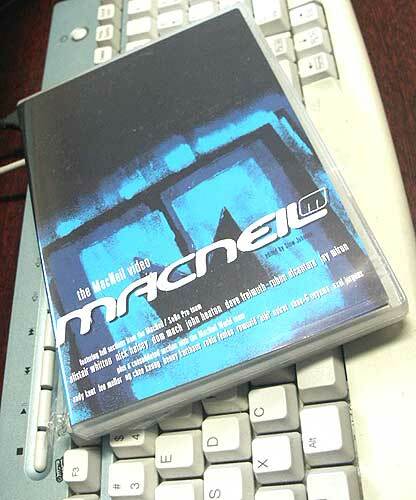 The MacNeil video Edited by: Stew Johnson Rating: **** Time: 40 minutes Riding: Mostly Street / Dirt / Park The MacNeil team are one international bunch. Over the years Jay Miron has traveled all over the world and met lots of killer riders. Some of them are making up the MacNeil squad. With so many talented riders on board it is hard to make a DVD fail. Tough part is to get the right amount of footage from every rider to finish the video. It took a while to collect all the tapes and many different filmers were used on the MacNeil video. The editing was left up to Stew Johnson who is one of the best in the field. If his name sounds familiar to you but you don't know where to place it, think Props, RoadFools and you get an idea of the clean-cut smooth and clear editing. Props: The Best of 2003 Production: Props Visual Rating: *** The Props crew are well organized and send us all of their DVD productions. 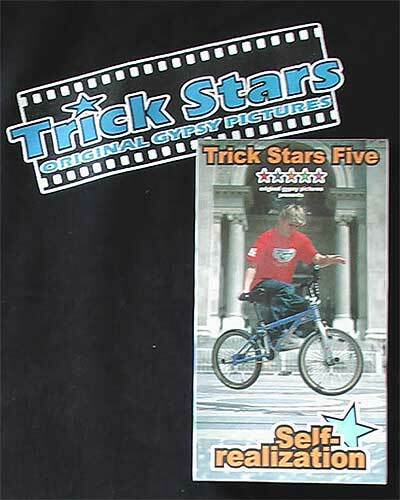 That includes the How-To DVD's, MegaTour DVD's, Roadfools and every issue of Props. Every time the year-end DVD comes in it's the same story. We've watched all of their productions so most of their footage we're familiar with. However, with the DVD's there's room for extra's. The Best of 2003 has bonus Toronto Metro footage and a 2003 Credits Compilation which is always the funniest part of the Props videos. On top of that you get the Best of 1998 free! Lots has changed in 5 years, I tell you. 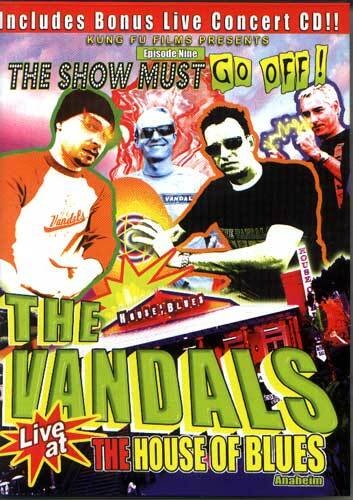 Produced by: Kris Martinez and Joe Escalante Shows: The Vandals Live Rate: *** Time: 1h 10min + extra bonus Music: punkrock Company: Kung Fu THE VANDALS LIVE AT THE HOUSE OF BLUES ANAHEIM The show must go off! is a Live dvd out of the famous House of Blues in the Oldtown of Vans shoes Anaheim. 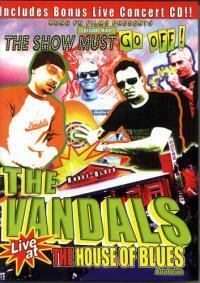 Twenty two songs of the Vandals filmed 8 cameras & 24 tracks is like you are almost live at the concert and looking to this DVD on a big screen you almost want to go on stage to dive back into your living room! Title: STANDPOINT #4 Edited by: Ryan Navazio Filmed by: Mike Puorro, Ryan N and many more Time: 45min without bonus section Rate: ****1/2 Shows: Street, Dirt, interviews This was the first Standpoint I saw so I can't tell if the quality is been better than before but it is almost impossible to make it better. 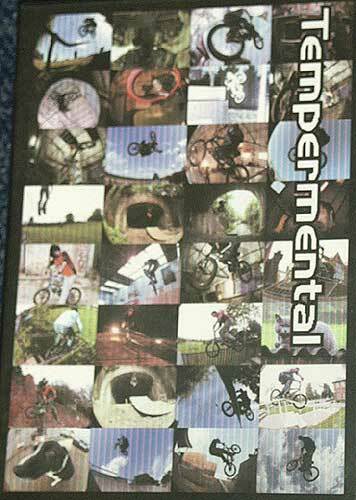 This DVD is awesome and filled with stuff from the East of the US like the crazy FBM Ghetto comp which was a blast with all those crazy obstacles and even more insane streetriders. Van Homan and Leigh Ramsdell are doing the House spot check in their own castle, George Dossantos had a great interview and shows how nice he is as a person but also how good he is as a rider! 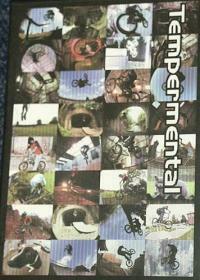 Title: Tempermental Production: Rob Ridge Rating: **1/2 Rob Ridge has been misunderstood in the past. He's a 30+ rider, runs a skatepark and is one hell of a tech bike rider. He'll fit in the Dave Freimuth, Tobias Wicke, Rick Moliterno category with his wild style of nosepick-tailwhip tricks on spines. His freecoaster gives him the opportunity to go fakie and his own park gives him the chance to build strange obstacles for even crazier tricks. Rob is not afraid to huck himself down massive rails either or flip a dirt jump. Rob "takes it" a lot and throws his bike but to progress, you have to fall down and get back up. Tempermental is more than Rob Ridge. 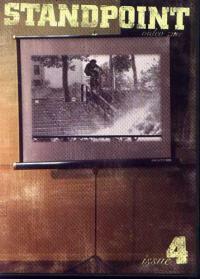 (Local) Riders that are not so well known get footage on the home-copied DVD. Title: RoadFools 12 Production: Props Visual Ltd. 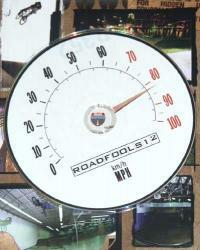 Rating: *** Even though the idea of Roadfools is a bit played out, the RoadFools DVD's are a must see. You don't want to miss Nyquist get slapped in the face by a girl (at a party all for fun) and see Seth Kimbrough's band for instance. To keep in the loop of the development of BMX, watching the RF productions helps. The crew of Stuart King (UK), Sergio Layos (Spain), Scott Malyon (UK) teams up with Northern Americans Scerbo, Hamilton, Young, Arata, Kachinsky, Barrett, Porter, Martinez and Enns (Can). Mirra Images, The story of my life By Dave Mirra with Mark Losey Regan Books ISBN 0-06-098916-5 Paperback Price: $ 15.95 USA I contacted Dave for a copy of his book to review on FATBMX.com. He put his Familie in charge of it. The book arrived but also the $40,= USD shipping bill. That's one way to treat the media that you need for a (positive) review on the book. 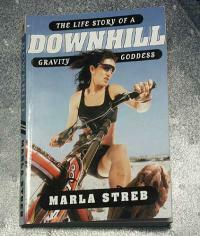 The Life Story of a Gravity Goddess By: Marla Streb A Plume Book ISBN: 0-452-28458-9 USA: $ 14.00 USD I contacted the publisher for a copy of Marla's book and they sent it to FATBMX in a heartbeat. 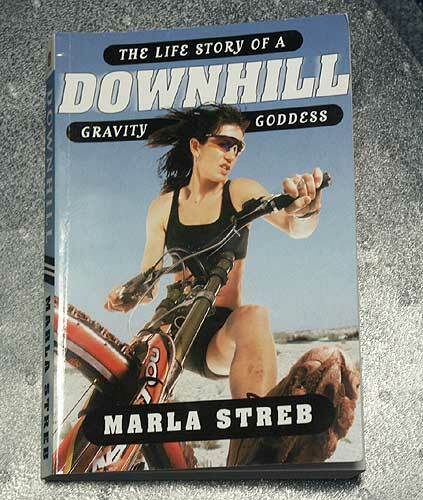 I did not know what to expect but thought that there would be some kind of connection with BMX as most Downhill riders started out racing BMX. When flipping through the pages I noticed the word: BMX in chapter 1 and started reading. It said: "As a kid I never owned or raced a BMX bike. 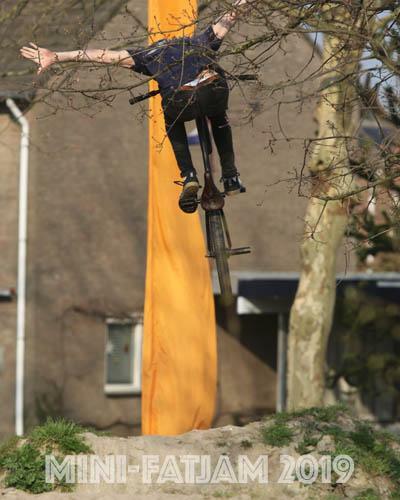 I never built a plywood ramp in the driveway from which to launch summerlong jumps." That's when I handed over the book to my wife for her to read it and do the review. 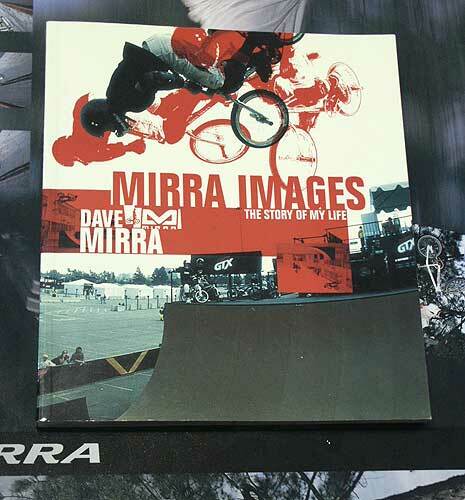 By: Kay Clauberg contemporary BMX photography Tropen Verlag ISBN 3-932170-71-7 Price: 19,80 Euro Size: 27cm X 27cm - paperback We've all seen him haul his photo equipment around at a contest or two; Kay Clauberg. Ring-flash here, umbrella there, extra accu's for remote flash power, long lens, fish eye, you name it, it's in his backpack or on his stroller. Kay's photo book is a direct result of a University project. Once the single copy was done it was time to find a publisher to print it. This turned out to be a tough case. Only with the help of the Carhartt people Kay could afford to have the book published and put it on the market for sale.